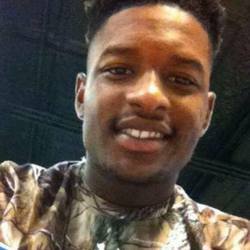 20-year-old Delvin Tyrell Simmons, a student at Limestone College in Gaffney studying Early Childhood Education, was killed by Spartanburg police on November 9, 2015. Spartanburg County deputies said two suspects ran from Spartanburg Methodist College campus police officers responding to a reported car break-in near Sparrow Residence Hall. An officer pursued one male suspect who fled to a vehicle. The suspect did not listen to verbal commands made by the officer, struck the officer with the car and the officer shot at the vehicle, deputies said. Lieutenant Kevin Bobo with the Spartanburg County Sheriff's Office said the responding officer feared for his life and defended himself by shooting at the vehicle. Simmons was killed. A second suspect was arrested after he fled on foot. That suspect admitted that he was involved in the car break-ins at Spartanburg Methodist College. He said he is also a student at Limestone College and that Simmons was his best friend. Police Chief Teresa Ferguson at Spartanburg Methodist College released the names of the officers involved in the incident as Andrew Tomlinson and Justin Yarbrough. Spartanburg County Sheriff Chuck Wright said there is no dash cam video or body camera footage, but that are surveillance cameras in the area. On March 3, 2016, the South Carolina Law Enforcement Division announced they had cleared Spartanburg Methodist College Officer Andrew Tomlinson of charges stemming from the killing of Delvin Simmons. On November 9, 2017, it was reported that the family of Simmons was suing Spartanburg Methodist College, its public safety department and Officer Andrew Tomlinson.